Steel construction is playing a vital role in Rochdale’s ambitious multi-million-pound Riverside regeneration scheme. Financial woes and the continuing rise of online shopping have forced numerous household names in the retail sector to close down in recent years, leading to grim forecasts about the viability of the traditional high street and town centre malls. Whether the forecasts are correct, only time will tell, but a number of towns and cities up and down the country are still investing in new retail and leisure complexes, specifically designed to become destinations to regenerate town centres and woo shoppers. An example is Rochdale Riverside, which forms one of the final parts of a £250M investment package, which has been transforming the town centre beyond all recognition since 2011. Other schemes which have been delivered as part of this ambitious regeneration programme include a new customer service centre, a library and council building known as Number One Riverside (see NSC June 2012), the new Rochdale Leisure centre, Rochdale Sixth Form College, (recently rated outstanding by Ofsted), and the award-winning river re-opening project. Rochdale Riverside includes 18,500m2 of steel-framed retail and leisure accommodation, with approximately 24 new shops, restaurants and a six-screen cinema. It is hoped that this £80M development, with a central pedestrian street as a key feature, will transform the retail and entertainment offering in the town and encourage further inward investment. Because of the project’s town centre location, a number of logistical challenges have had to be overcome. Access to the site has been altered a few times to take into account neighbouring premises, while the road layout had to be redesigned. A road originally crossed the site, and this has been closed and ripped up, while another route, between the construction plot and the site compound has been maintained to allow access to the adjacent existing shopping centre. “A huge amount of services, beneath the old road and serving our neighbours also had to be diverted,” adds Mr Howarth. 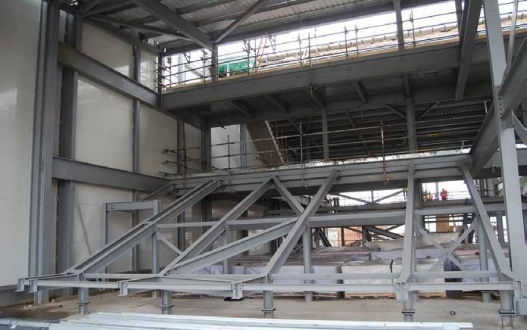 Steelwork contractor Hambleton Steel was able to begin its erection programme late last summer, with the work split into three main phases to allow other trades to clad and fit out areas which would otherwise become inaccessible. The project’s initial steel design was done by Curtins, but Hambleton Steel were later appointed on a design and build contract by Willmott Dixon. Hambleton Steel subsequently value-engineered the steelwork and incorporated a few design changes that had arisen because of various client wishes. Overall, the Riverside scheme consists of five steel-framed structures, a three-storey cinema block, two retail blocks known as north and south which are separated by the pedestrian thoroughfare, a two-storey Marks & Spencer anchor store and a three-level car park. 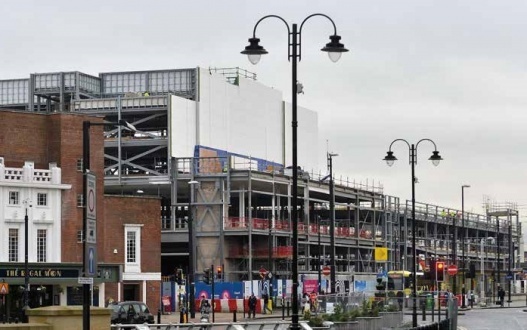 In order to allow the site to be constructed in a sequential manner, Hambleton is erecting the steel in a west to east direction, starting at the point nearest to the existing retail outlets and finishing close to John Street, one of the town centre’s busiest thoroughfares. The three-storey cinema block was the first structure to be erected. This building will eventually accommodate retail outlets on the ground floor, leisure facilities on the first floor and the six acoustically-isolated cinema screens on the upper double-height level. The structure also accommodates a ground level service yard, which has a floor level lower than the rest of the structure to allow it to have more headroom for delivery trucks. Creating this column-free space is a series of five 17.5m-long × 1.5m-deep plate girders, each weighing 10t. Originally, these members were going to be trusses, but Hambleton changed them to plate girders as this was considered to be a more economic option. Separated by a movement joint, retail block south abuts the cinema forming one continuous 150m-long building. Similar to the opposite 115m-long north block, both retail structures are double-height spaces with the potential to be a two-storey structure with the addition of a mezzanine level. The blocks are each subdivided into individual units, with three already containing first floor mezzanines. Highlighting steelwork’s flexibility, the retail tenants can opt to keep their units as large double-height spaces or insert mezzanines at a later date or during the fit-out programme. The Marks & Spencer anchor store measures approximately 50m x 50m and is a two-storey structure, containing 300t of steel, three precast staircases and three lift shafts. Designed around a regular grid pattern, the majority of the anchor store’s internal spans are 9m, allowing plenty of column-free retail space. 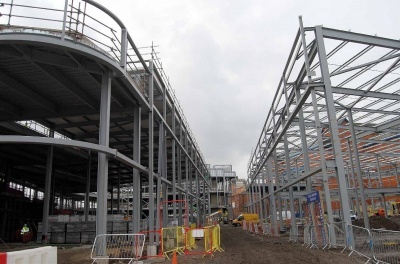 The final piece of the steel erection process will be the three-level car park, which is due to begin this month (April) and complete by the end of May. Although Hambleton are fabricating and erecting this structure, it has been designed by specialist car parking consultants Hill Cannon. The three-level structure will provide 522 parking spaces and has been designed around a standard 15.6m × 7.2m grid in order to provide unobstructed bays.